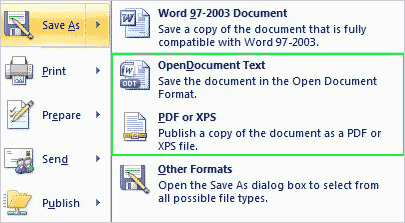 XPS is a file format extension for specific type of documents. We have already seen free Micosoft XPS viewer software to open and view XPS files. You can also crete and further edit XPS files within Microsoft Office Word 2007 installed on your computer. This is possible by installing free MS Office 2007 addon “Microsoft Save as PDF or XPS”. Installing this add-on does not give Office 2007 the ability to edit XPS documents, only save out as XPS. For example, I used the XPS Printer in Windows 7 to save the results of a report to XPS. I then tried to use Office 2007 to add additional content to the report and Office 2007 is unable to open it. It gives a “cannot be opened because there are problems with the contents”. I see my Save as PDF or XPS option and have used the PDF option numerous times. In case it was some wierd formatting issue with the XPS Printer, I opened Office, typed in “test”, then saved as XPS. It opened up with the viewer just fine after saving, but then when I try and re-open this xps file with Office I get the same “cannot be opened because there are problems with the contents” message.